My husband walked in with an armload of flowers and a smile on his face. Peeking out of their cellophane sleeves the roses and baby’s breath brightens the room. Their arrival in our kitchen ended a 2,000-mile journey, which likely began on another continent. In 1969, a group of American growers created Floramerica, the first international flower growing operation near Bogotá, Columbia. Cheap air transportation allowed them to leave behind U.S. rising labor costs and ever-tightening environmental requirements. Until that time, the flowers brightening our lives were grown here—mostly on the west coast in California, Oregon, and Washington. Today, Columbia is the top grower and exporter of cut flowers for the world market. Flowers from your grocery store likely began their life in a greenhouse in South America. Once harvested, they were dipped in chemicals to stop any pest or bacterial problems that would prevent them from entering the country. After they passed through U.S. Customs they probably headed for a wholesale market such as Miami where distributors purchased them and then delivered them to their customers—grocery and discount stores, florists, and Internet and toll-free marketers. This process usually takes seven days and it’s done dry. The flowers aren’t watered until they reach the seller who readies them for sale to my husband. So I shouldn’t be surprised if they only last another 7 to 10 days in the vase in my kitchen. But more consumers are starting to question this far-flung system and the desirability of a bouquet of chemically dipped flowers on their dinner table. 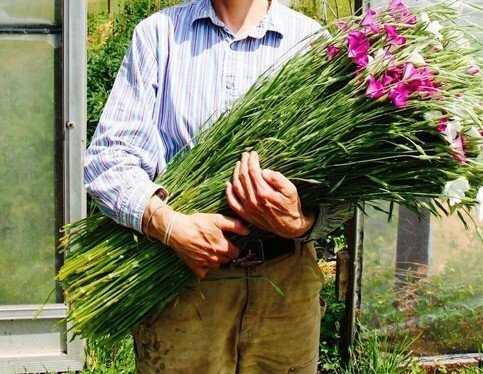 As a consequence, flower farmers have taken a page from the farm to table story and focused on producing high-quality, sustainable flowers for local markets. Customer demand has begun to pull locally grown flowers from farmers’ market stalls into florists and some specialty grocers in our area. This is big business. The North Carolina Department of Agriculture reports there are over 19 million square feet of greenhouse space dedicated to flower production in our state. While California dominates flower production in this country, North Carolina hovers near the top. Last year, our cut flowers had a wholesale value of over 254 million dollars. It’s the quality, selection, and value that drive consumers to purchase local flowers. 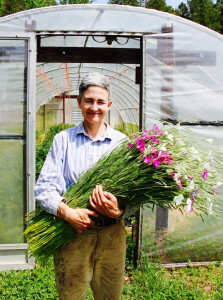 Leah Cook, of Wild Hare Farms in Cedar Grove, points out that she can provide her customers with unique flowers. You won’t find hers in the mass market because they won’t survive the shipping ordeal. Skipping the shipping means local flowers are going to last longer in the vase in your home, and consumers and florists are starting to take notice. 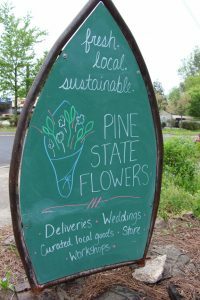 Maggie Smith, owner of Pine State Flowers in Durham, specializes in creating floral designs using local flowers. By using what is seasonally available, her arrangements can tell a story about the time and place the flowers come from in a way that a vase of red roses in January can’t convey. And telling a story is part of the reason we buy flowers. Two-thirds of the flowers purchased in this country are as gifts with nearly two billion dollars spent on Mother’s Day flowers alone. Now, my husband comes in the door with flowers wrapped in newspaper that he bought at the farmers’ market. We delight in meeting the farmers who grew them, finding out their names, and learning their stories. Dr. Lise Jenkins is a NC State Extension Master Gardener Volunteer in Durham county and produces the Triangle Gardener podcast.